In this issue we report on our advances in treating Hepatitis C, tumors and transplants, our progress arresting cancers that have spread to the abdominal wall, and new discoveries about the importance of nutrition and the gut microbiome in small bowel transplants. Please see our comments, as well, on the case for overlapping surgeries. 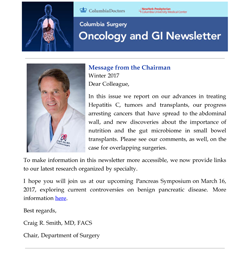 To make information in this newsletter more accessible, we now provide links to our latest research organized by specialty.